Synopsis: With the 70’s behind him, San Diego’s top rated newsman, Ron Burgundy (Will Ferrell), returns to the news desk in “Anchorman 2: The Legend Continues.” Also back for more are Ron’s co-anchor and wife, Veronica Corningstone (Christina Applegate), weather man Brick Tamland (Steve Carell), man on the street Brian Fontana (Paul Rudd) and sports guy Champ Kind (David Koechner) – all of whom won’t make it easy to stay classy… while taking the nation’s first 24-hour news channel by storm. Review: It is now undeniable that the original Anchorman (way back in 2004) has become a cult classic, chock-full of quotable quotes and finding an extended life in home video. The fact that it took almost ten years for the sequel to be made means that there’s a fair bit of pent-up demand for the movie (myself included, being a fan of the first installment). Although Anchorman 2 remains a very entertaining movie, there are more misses this time round, and an overly long running time means that Ron Burgundy and crew nearly outstay their welcome. No one who willingly enters a theatre to watch Anchorman 2 would be surprised by what the film has to offer – essentially it’s more of the same, and that’s mostly a good thing. There are some side-splittingly hilarious sequences in the film, and much like the first movie there are some truly unfunny skits as well. The biggest problem Anchorman 2 presents, however, is that it’s running at almost two hours, and the places where the film falls flat feels much longer (and more painful) this time round. It’s clear that Will Ferrell had employed his clout in Hollywood to amass a truly impressive list of cameos in Anchorman 2, albeit mostly contained in the finale which is a retread of a scene in the first Anchorman (and honestly, it was better the first time). Set in the early 80s, the film boasts an excellent retro soundtrack that would be instantly familiar to anyone acquainted with the period. Attention to detail also seems pretty spot on, and thus the film not only hits the funny bone but also plays into a nostalgia factor. Amidst all the tomfoolery, the film actually makes a pretty astute comment about broadcast news that remains valid to this day. It’s not all low brow and juvenile humour, but the same can be said of the original Anchorman so it’s really not that surprising. 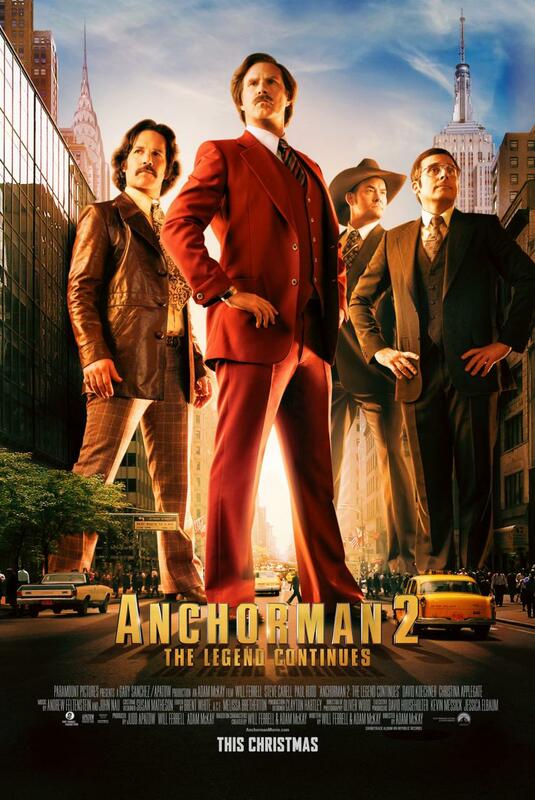 However, the true intent of Anchorman 2 is clear: to strive to be a funny movie. Even though it’s not a great movie, it does manage to deliver a good number of laughs. And ultimately, that’s all it really needs to do to get a pass.